I have been an artist for as long as i can remember. My mother still tells the story when I had to create my first drawing in kindergarten, and how impressed they were, because i went into serious detail when drawing one of the rooms in our home. When i was a child my father use to wake me up every Saturday and Sunday so that we can both watch cartoons. I believe this is one of the reasons why I was so inclined to drawing cartoon like characters. I was born in Cambridge Massachusetts and raised in Portugal. I am an illustrator and graphic designer with a B. F.A in Illustration from Pratt Institute. I always carry a pencil and some paper where ever I go. I like to be able to sketch cartoon characters, with funny faces and sometimes acting foolish. My mind is always at work and when I least expect it I have tons of news ideas for new characters in funny situations. I work in acrylic and watercolor pencil. I have also painted on ceramic - over glaze and under glaze technique as well as worked as a drafter. I also enjoy painting murals in children s' rooms and painting canvas murals. I have learned to paint floor cloths. I am always trying to learn new techniques. It's just the way I am, if I am not creating something, I am thinking about it. I have thought cartooning in an after school program to middle school children. It was an amazing and fun experience. It was great that I can make a difference in their lives. This last year, I have been working has a freelance graphic artist. It's been a great experience, I enjoy creating even though it's using the computer. My big passion is creating fun characters that make children happy and want to be artists them selves. I have written two children s' books and illustrated both. I am researching the market to find an agent, so that I can publish one or both of my books. I welcome any suggestions and information on how to get a good agent. I am in the NY /NJ area. Mr. 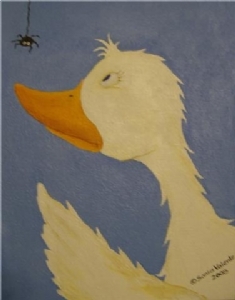 Duck is a character I came up with recently, I find him very cute and surprisingly interested in the spider. This gallery contains 9 pictures, click a picture to view a larger size. Hi Sonia, Thanks for being a friend. Hope you find a publisher soon. I am also looking into publishing a book. Your story is smilar to mine. When I was five I was already creating a story and illustrating it. I couldn't put my pencil down and always was thinking in my next drawing. We are blessed with a wonderfull skill. Thank you for the comment. Best of luck to you. Your illustrations are adorable! Bond would love it if you read his book. Thanks for being a friend! Oh, I know those "Computer Troubles" too well! Sonia, your art is very beautyfull! congratulations!! your images are adorable... I love the duck with the ladybugs! Sounds good, Sonia--I'll look forward to the new uploads! I was a freelance graphic designer before I turned to illustration--it's fun to make contact with another illustrator who has a similar background. Love Mr. Duck--you need to get a website up so people can see more of your work! Best wishes and good luck with your book projects. Hi Sonia. I'd love to see some of your work!